I did something rather out of character for this week’s Well Played podcast with my fellow gaming writers Julie Grey (@GamecultureNZ), Siobhan Keogh (@SiobhanKeoghNZ), Aylon Herbet (@Aylon133) and Chris Leggett (@Leggetron). I actually sang “Space Mariiiiines”, on the spur of the moment, in my talk about THQ’s Warhammer 40,000: Space Marines. No, really I did. I’ve listened to it and am rather embarrassed about it. Listen for yourself and see if you can hear it. I’ve gone all red in the face just thinking about it now. We kick the podcast talking about Nintendo’s “surprise-but-not-a-surprise” add-on analogue stick for the Nintendo 3DS. Apparently it’s going to cost something like $US19, which isn’t a great deal but still, I find it unfathomable that Nintendo is mucking about with the design of a not-even-a-year-old console so early in its lifespan. I know a while I ago I said Nintendo wouldn’t do it: but I’ve been proved wrong. We chat about Resistance 3, the latest game from Insomniac in the fight-against-the-aliens game, Chris gives his opinion on the HD remakes of PS2 classics Ico and Shadow of the Collosus: his verdict is they are well worth buying so I think that’s what I’ll be doing when they come out, and Siobhan, Julie and Chris discussed the Assassin’s Creed Revelations multiplayer beta – I downloaded the beta client but then didn’t have time to look at it. I think it ends this weekend after Ubisoft announced it was going to extend the testing for an extra couple of days. MW3 USB stick: hup, hup, hup, hup, hup! The highlight of this week was a trip across the ditch to Sydney on Tuesday to chat to Infinity Ward’s creative strategist Robert Bowling and have some hands-on time with some of Modern Warfare 3’s multiplayer modes. Apparently this was the first time the multiplayer maps had been played outside of the recent COD XP event in Los Angeles. A big thanks to Activision for getting me across to meet with Bowling and spend some time with the game. I’ve never been a big one for COD’s online game. I enjoyed the single player campaigns mostly, apart from Black Ops which I actually thought sucked big time but have never really had the time or the skills to actually devote hours into the game’s multiplayer modes. Now, I’m not going to say that after my hands-on with MW3 online modes that I’m going to suddenly forsake everything and only play MW3 – because I won’t – but it got my interest up. I also got to spent 10 minutes (yes, 10 whole minutes!) chatting with Bowling about MW3-related things then playing the game: I especially like the mode where you have to collect the dog tags from fallen enemies for the kill to register: No dog tags, no confirmation. It was fun – although the only downside to the multiplayer session was the two Aussies who just refused to shut the hell up while they were playing. One of them especially loved the sound of his own voice as he was just blabbering on continuously, most about crap. It was like he was the appointed cheerleader and team leader all in one. I was almost tempted to not wear the headset just so I wouldn’t hear his voice – that’s how annoying he was. 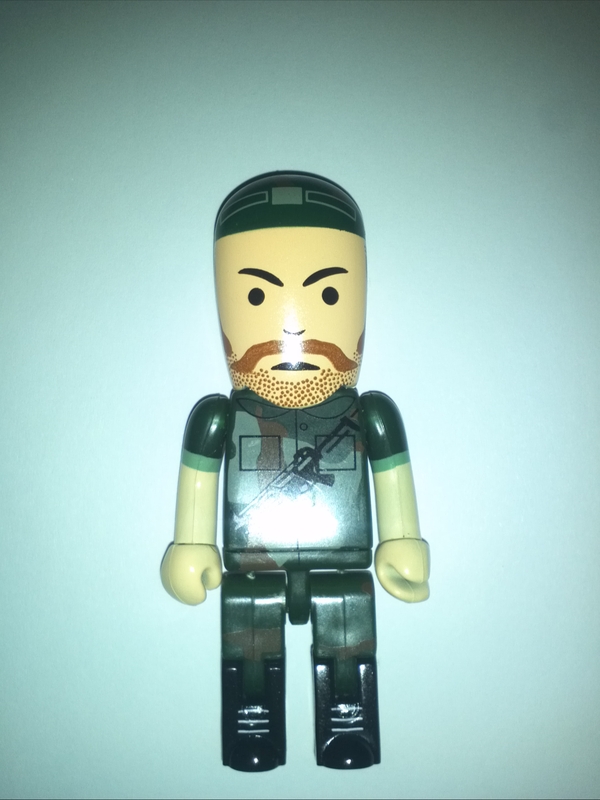 I got a pretty neat USB stick in the shape of a MW3 soldier, as well. Someone at work thought he looked a little like Chuck Norris. He does, kind of.